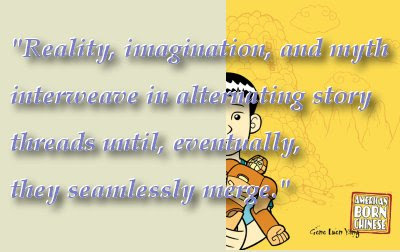 In our review of American Born Chinese (First Second Books) on our sister blog Readers' Rants, we described Gene Yang's graphic novel as "much more than just the story of a bicultural boy trying to fit in. Reality, imagination, and myth interweave in alternating story threads until, eventually, they seamlessly merge." Yang draws from American pop culture and ancient Chinese mythology in his groundbreaking work. Expertly told in words and pictures, Yang’s story in three parts follows a Chinese American teenager’s struggle to define himself against racial stereotypes. In the past, Yang (seen in the self-portrait at right) was a recipient of a Xeric Grant, a prestigious award in the comics industry, for Gordon Yamamoto and the King of the Geeks. He is also the author of Duncan's Kingdom (with art by Derek Kirk Kim) and The Rosary Comic Book. Besides creating comics, Yang teachers computer science at a Catholic high school in the San Francisco Bay Area, and is interested in the potential of comics as a teaching tool. He recently took the time to participate in the Summer Blog Blast Tour and answer some of our nosiest questions—about his high school students, the strengths of the comics medium, and the multiple facets of American Born Chinese. Our thanks go to Gene for his thoughtful answers to our questions, and to his events manager Kate Kubert Puls and publicist Gina Gagliano as well for their assistance. FW: Congratulations on creating a fabulous, award-winning work. How did your students at Bishop O'Dowd react to your National Book Award? Did it mean much to them, or did they simply take it in stride? Thank you! Thanks for doing this interview with me, too! Overall, my students have reacted very positively. A couple of them have even brought books to class for me to sign. This is a good change of pace. Usually all I get to sign at school are detention slips. FW: How much are you able to use comics in your teaching, and what kind of role do you think comics might have in education? Have you ever brought your own work into the classroom? I'm not currently using comics as part of my curricula, but I have in the past. I used to teach a Computer Art class in which one of the major projects was a student-produced comic. Also, in an Algebra class, I used comics to present new material when I couldn't be there to lecture in person. Even now, though, my subjects are not completely removed from comics. In my introductory programming class (I'm a Computer Science teacher), we've just started using a new programming language called Alice. Alice is a graphics-based object-oriented programming language. Program output takes the form of interactive 3-D animations. Alice employs a lot of comic book lexicon. The objects speak in word balloons, for instance. Also, in addition to lecturing on control structures and data types, I can talk to my students about narrative sequence and framing shots. I think that with today's visually savvy culture, comics are an important part of literacy. Many, many teachers of reluctant readers have found great success with comics. In my personal experience, I've found comics to be a "gateway drug" of sorts to the wider world of reading. FW: What inspired you to tell this story in graphic novel/comics form? What about the story do you feel was uniquely suited to visual narrative? Well, I've been an avid reader of comic books since the fifth grade. I think the comics medium is a vast, unexplored territory. There's so much inherent power that is just beginning to be exploited. Cartooning is really about distilling an image to its essence, about perceiving the core meaning of something and conveying it in an economical way. This is a very powerful way to communicate. For instance, stereotypical cartoon imagery really packs a punch. We can see evidence of this from people's strong reactions, both positive or negative, to political cartoons. In American Born Chinese, I wanted to leverage that punch for my story. FW: American Born Chinese was deeply meaningful for us because it had to do with ethnic identity. It's all too easy to wimp out on expressing cultural identity in favor of assimilating into the mainstream, or to feel like we don't know enough of our cultural heritage to feel like we have an identity, and these are both issues brought up in your book. The character Wong Lai-Tsao says that finding one's true identity is the "highest freedom." Do you feel that you have found your true identity in writing comics? Has working on this project affected your feelings about your own cultural identity? Working on American Born Chinese definitely forced me to contemplate my own identity. I think Asian-Americans are in the midst of defining a culture for ourselves that builds on, yet is separate from, American and Asian cultures. Culture is dynamic and changes over time. We are constantly in dialog with our culture. American Born Chinese offered me a chance to interact with my culture, to wrestle with what it means to be an Asian-American. Have I come to any conclusions? Not really, but that lack of conclusion is an essential part of culture, I think. It's something that we live, rather than just study. FW: Did the three storylines in American Born Chinese start as parallel, separate stories that later became intertwined, or did you plan the merging of the different "realities" from the beginning? I first conceived of the three storylines as three separate works. When I was trying to decide which to tackle first, I hit upon the idea of combining them into a single narrative. In the beginning it was almost more of an intellectual exercise than anything else. I wanted to shock the reader when the three stories collided. FW: How have people reacted to Chin-Kee? Do you feel that people have misunderstood him? Have you felt, like Dave Chappelle, that people are laughing at the stereotypical depiction of Chin-Kee, instead of with you at the stereotype itself? There definitely is that danger. Every now and then I'll get a piece of feedback that makes me take a step back. "Chin-Kee is hilarious!" it'll say. But the majority of the feedback is with me. Most people understand what I'm trying to do. They can sense the anger behind my depiction of Chin-Kee. I also take comfort in the fact that so many of the folks who've really gotten behind the book are librarians and educators. By definition they're a very literate group. They know how to approach discussions about the book with young people. 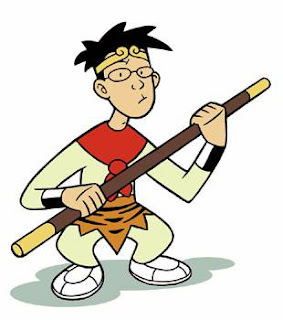 FW: Tze-Yo-Tzuh is one of the coolest characters in American Born Chinese. His lines to the Monkey King parallel the 139th Psalm, where King David talks about fleeing from the presence of God. You describe The Monkey King as a traditional Chinese folktale; are these parallels with Biblical themes coincidental or deliberate? This was deliberate. I wanted to give the entire story an Asian-American mythological foundation, so I needed to blend East with West. In the original tale of the Monkey King, he's imprisoned by Buddha. I replaced Buddha with the Western Judeo-Christian God. In part, I did this to draw out the similarities and differences between the two worldviews. I hope that to someone who is familiar with the original story, my version offers a contrast that says something meaningful about the similarities and differences between Asians and Asian-Americans. FW: The "real life" parts of your book were vivid and infused with painfully realistic humor, such as the scene in which the main character talks about being expected to marry the one other Asian kid in his class, Suzy Nakamura. Were any elements of this story inspired by real-life events, either from your life or someone else's? That particular event was true. There was a Japanese-American girl in my class during elementary school, and our classmates would tease us about eventually marrying one another. I remember trying to avoid her. American Born Chinese is a work of fiction with bits of autobiography sprinkled in. A second example of reality informing fiction is the Timmy character, the one boy in the Jin storyline who is explicitly racist. Many of the words from his mouth came from a small group of boys who used to torment me and my Asian-American friends in my junior high. They would make snide comments at us as we passed them in the hallway. They were clearly the minority; most of my classmates, regardless of cultural background, were very respectful of culture. But that vocal minority affected my thinking. I began to wonder, "Do all whites think these things? Are most of them simply too polite to say it out loud?" FW: In a storyline that comes full circle, Wei Chen's redemption is now the responsibility of the narrator, who himself was saved, in part, by Wei Chen being his classmate. There seems to be a bigger message here about our responsibility to each other -- can you elaborate on that? I think that comes from my Catholic faith. In Catholicism there's this idea that we are saved as a community. In ancient times, when folks joined the Church, they would join as families or even as villages. That's where the practice of infant baptism comes into play. Practically speaking, this idea puts great emphasis on right relationship with one another. Your personal destiny is intimately tied to your relationships with other people. FW: What projects can we look forward to seeing from you in the future? What are you working on? Right now, I'm finishing up a project with Derek Kirk Kim, a fellow Bay Area cartoonist. Derek is a phenomenal talent. He's won the triple crown of comics industry awards. An Eisner, a Harvey, and an Ignatz all sit on his shelf. Years ago in the late 1990's, we did a fantasy mini-series for Image Comics called Duncan's Kingdom. We're now creating two more short stories which deal with similar themes. First Second is set to publish all three as short story collection in late 2008 or early 2009. I'm writing and Derek is drawing. Periodically, he'll send me pages over the Internet. They're absolutely amazing, really beautiful stuff. I'm pretty excited about it. Gene's website, including some of his other projects: a discussion of the educational potential of the comics medium; Factoring with Mr. Yang and Mosley, an online comics-based unit teaching factoring; and more about the Monkey King. YALSA Podcast #18 - Interview with Gene Yang: Berkeley Public Library librarian Francisca Goldsmith talks with Gene about his writing process, advice for those interested in going into creating graphic novels, and more. This interview - and the way you presented it - is flat out amazing. What a great job guys...it's really really wonderful! I second what Colleen said. This is so well-done and an interesting interview. SO NICE! Thank you! Thanks, guys. We were sort of modeling ourselves after 7-Imp, actually--you always post such informative interviews! Excellent interview, both content-wise and layout wise. You guys have set a gold standard for the SBBT, I believe! Aw, blush blush. That's a huge compliment. Thank you. Yours looks really nice. What a great interview. Gene sounds very cool. I really enjoyed reading his answers to some very interesting questions. Great work. Thanks! I agree with Jules, and the other commenters. This is a great interview - really thoughtful and interesting. I can't wait to see what Mr. Yang does next.